Whenever we talk about a medieval knight our reveries cling on to the resplendent image of a chivalrous warrior incredibly armored from head to toe, while being mounted atop a great warhorse. Now while reality is not far from this imagery, there was historically more to the scope of knighthood than just mowing down the ‘lesser’ infantrymen in battlefields of the middle ages. In fact, the very term ‘medieval knight’ is a pretty generic one, and their roles across the realms and fiefs of Europe differed considerably, especially when it came to administrative and land-holding side of affairs. In essence, the role of a knight extended far beyond the battlefield, and ranged into seemingly mundane avenues like petty judges, political advisers to even glorified farmers (at least in the initial years of 11th century). Obviously in this article, we will cover the martial ambit of these warriors/social elites, and thus by ‘medieval knight’ we would denote the European knights of the middle ages who shared overlapping attributes in (mostly) military affairs. Now the knight of the 12th century was naturally not a unique creation of that particular period, but he was rather a result of centuries of influence and evolution that marked the social and military changes in Europe and even Asia. To that end, the ordo (or order) of knights harks back to a period which was far older than the established clergy of middle ages. In fact, as Robert Jones points out (in his book Knight the Warrior and World of Chivalry) there were many parallels between the so-called knightly class and the Roman ‘equestrian’ class, with their social status being equated to fighting on horses, their hierarchy within the society as political elites, and their capacity to produce leaders and ‘officers’ for the respective contemporary forces. But of course, this doesn’t necessarily mean that the Roman equestrian plainly evolved into the medieval knight – as such a scope would be oversimplification. So while some nascent aspects of knighthood were possibly influenced (in a latent manner) by the Romans, there were also differences between the two, especially in combat and military affairs. 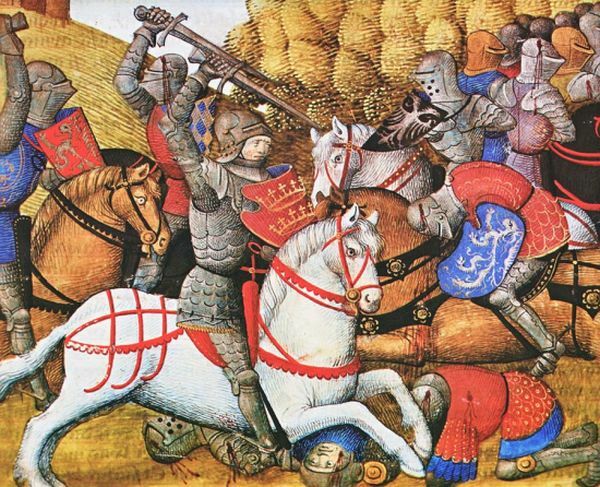 For example, while the equestrians mainly offered leadership roles in battlefields, the medieval knights also bore the brunt of fighting. Simply put, the Roman social elites were militarily supported by disciplined and paid infantry forces – and thus battle results were mostly dictated by such professional legionaries (as opposed to cavalry). In contrast, the medieval knight was the dominant force in the European battlefield roughly from 11th century to 15th century, and thus both battle results and societal changes were dictated by their rising power and martial prowess. In that regard, it is rather interesting to know that the feudal structure of then-contemporary Europe mirrored the Persian empire of the Achaemenids in their later ages. By the later part of the disintegrating Roman Empire (a process which took place over centuries), the perceived ‘barbarians’ like Franks and Goths were given the responsibilities of military affairs, while the detached ‘Romans’ only played their crucial roles in administrative and financial institutions. 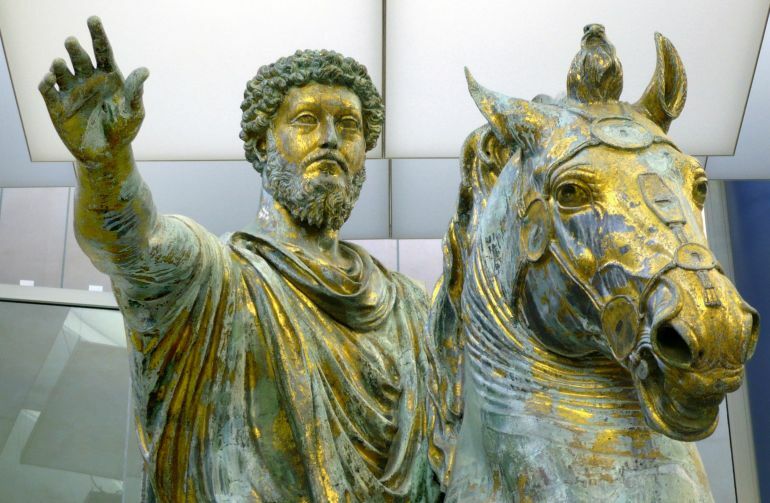 However by the 7th century AD, the Western Roman Empire had already dissolved, and the ‘barbarians’ now found themselves at the helm of ‘ready to grab’ lands and pastures. As a reactionary measure for both political and military control, these newly found kingdoms initiated social reforms (or at least adaptations) that put the landholding class at the fore of military campaigns. In essence, this pushed forward their perceived superior social status within the realm, while also making them crucial for military gains – thus creating an interrelated system where the warrior became attached to the revenues generated from the land. It should be noted that even by later stages of the Roman Empire, the military organization had largely separated from the state, with provincial governors, aristocrats and commanders recruiting their own chosen bodyguards. This trend continued and rather evolved by the early middle ages, with more potential recruits being available from the newly formed landowners and free men. The pueri (young men who were given military equipment and became warrior apprentices within elite households) and scarae (a Frankish term denoting extremely well-equipped and battle hardened warriors) were derived from such recruitment policies, thus paving the way for the emergence of a later knightly class. Once again, the view of the armored Carolingian horsemen being ‘prototype’ knights is an oversimplified one. This conventional view was partly held by many earlier researchers because of the development (or rather introduction) of stirrup into western Europe during the Carolingian times. From purely military perspective, the stirrup did allow the rider to be more secure on his horseback position, which would have made charges more potent with couched lance tactics. 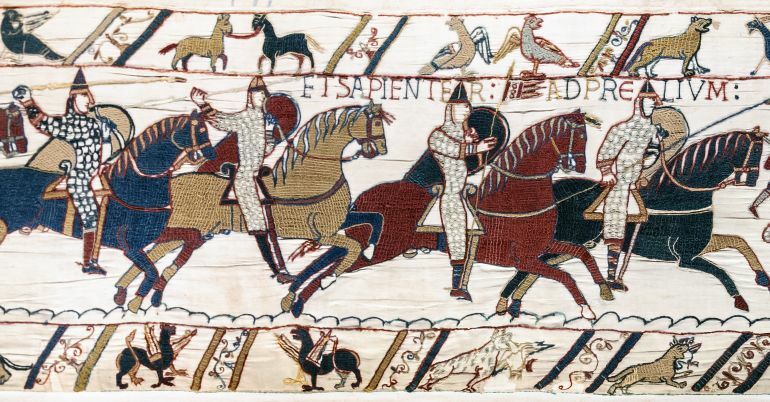 But the problem with such a conjecture is that couched lance postures were probably not adopted in European battlefields until the emergence of later Normans in 11th century. And more importantly, the relatively large number of horsemen fielded by the Carolingian kings was not really in response to eastern armies – as evidenced by the Battle of Tours where infantry won the day for Charles Martel. In other words, the emergence of knights pertained more to the contemporary social and political situations, as opposed to just military innovations. And such a societal scope presented itself at the end of 9th century AD, when the Carolingian realm was in complete disarray. During such a chaotic period, the ever powerful political elites detached themselves from the king’s authority and fought among themselves to take control of the empire’s land. Such internal conflicts encouraged the recruitment of armored and fast horsemen who could rapidly raid enemy territories and yet make their stands in actual battles. Mostly recruited from farmers (who were also free men), these cavalrymen were termed as miles, and were probably the original precursors of the medieval knights. As one can comprehend from the aforementioned points, the first medieval knight was not really the lord who dabbled in opulent affairs. On the contrary, he was of ‘relatively’ lower social status (though always a free man) who was brought forth to the political world because of his military prowess. Now by 12th century AD, the changes in feudal landscape had made sure that the medieval knight became a member of the upper society strata (in a hierarchy-based ambit) – though his economical means were not always mirrored by his superior status. Simply put, a knight’s property was till far lesser than the court nobles and monarchs, while the cost of arms and armor were also very high. 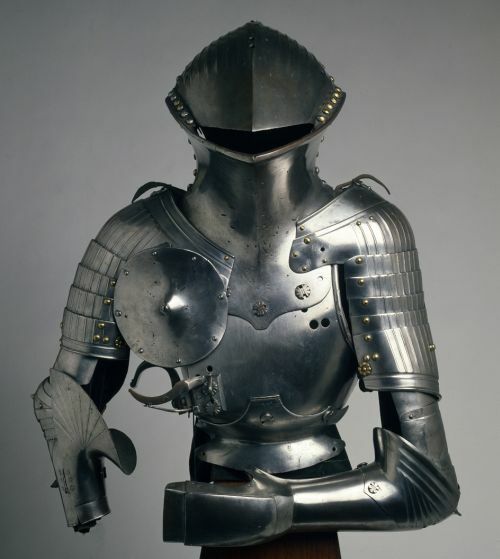 As a result, the intricate armor systems (and even ritzy dresses) were rather passed down from generations, as opposed to newer ‘models’ crafted on the whim of the medieval knight. On the other hand, the higher nobles and members of the royal households could still flaunt their ‘latest’ designs in both armors and apparel. This created a confused scope for chroniclers, with anachronistic armor styles overlapping certain periods. 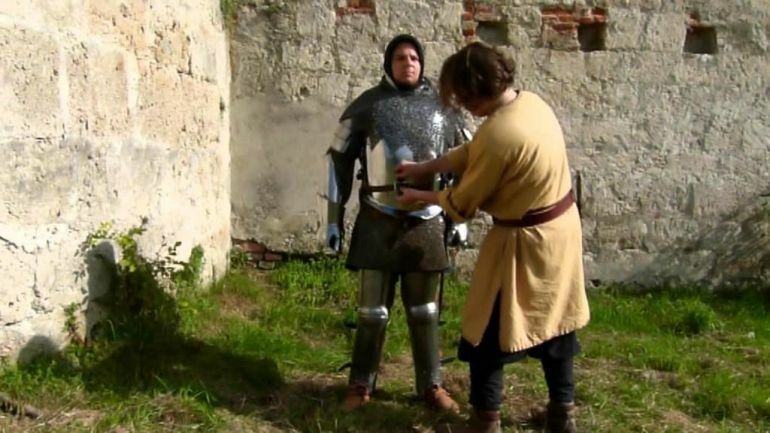 Furthermore, to keep up with the latest fashion or even technological edge, many medieval knights had to modify their armor over time – like the attachment of internal coifs to mail shirts. Much like the Spartan agoge, there was a process to becoming a medieval knight. By 13th century, such a procedure became more uniform throughout Europe, with the 8 year boy (of noble lineage) being sent away to the household of the lord. Here he became a page, thus basically taking up the role of a servant boy who ran errands. At the same time, he was given lessons in writing, music and handling of basic weapons. The latter part was adopted through various games and competitions that encouraged the boy to take up arms and maneuver them. By the age of 14, the boy was expected to become a sturdily built teenager with a propensity for loyalty and martial discipline. During this period, his rank was upgraded to a squire, which made him responsible for looking after the arms, armor and equipment of his superior knight (each squire was usually allotted to a specific medieval knight). Suffice it to say, the squire’s training also became more rigorous, with more focus on rules of tactics for horse mounted combat; and as a result even injuries became commonplace. Furthermore, some squires were also expected to hold their own in actual battlefields – which made their training dangerous while keeping up the spirit of ‘adventure’. Finally by the age of 21, the squire was ‘dubbed’ as a knight, where he took the chivalry oath (discussed later in the article). In the initial centuries, these dubbing scenarios entailed humble affairs with the lord slapping the newly assigned knight on his neck and then uttering a few quick words. However by the latter middle ages, the achievement of knighthood took a more ceremonious turn, with the church indulging in various symbolic and crowd-friendly festivities. By mid 13th century, Europe went through a revolution that encompassed spectator sports. 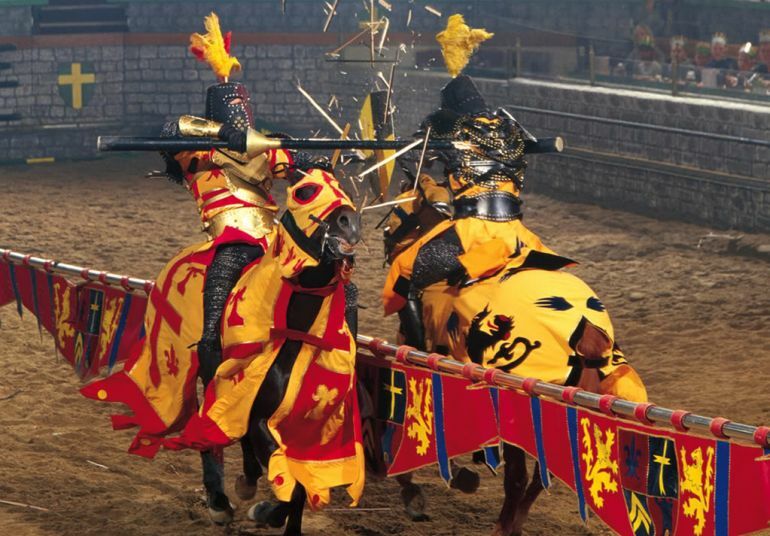 While in the preceding centuries, medieval knights did engage in ‘friendly’ competitions, these events quickly turned into full-fledged brawls with serious fighting and resultant injuries (and even fatalities). In fact, many of these free-form exercises (like the French melee) almost played out like actual gruesome battles – except for the presence of an audience. But a century later, most of these brutal demonstrations were relegated in favor of organized tourneys that focused on the ‘glorious’ essence of one-on-one combat. Thus the related games became dominated by individual jousts, thus giving rise to spectator sports in the medieval times. These organizational changes in public events also played their crucial roles in the development of certain armor types that were specifically tailored to jousting. The notion of a medieval knight in his full war panoply is surely intimidating, but the gilded patterns and the ostentatious accouterments in his armor (especially after 13th century AD) were probably not demonstrated in actual battles. In other words, the medieval knight wore a more practical variant of his armor in combat scenarios, while the ritzy stuff was kept aside only to be showed off in parades and tournaments. This doesn’t necessarily mean that ‘ordinary’ war armor was any less valuable or significant. 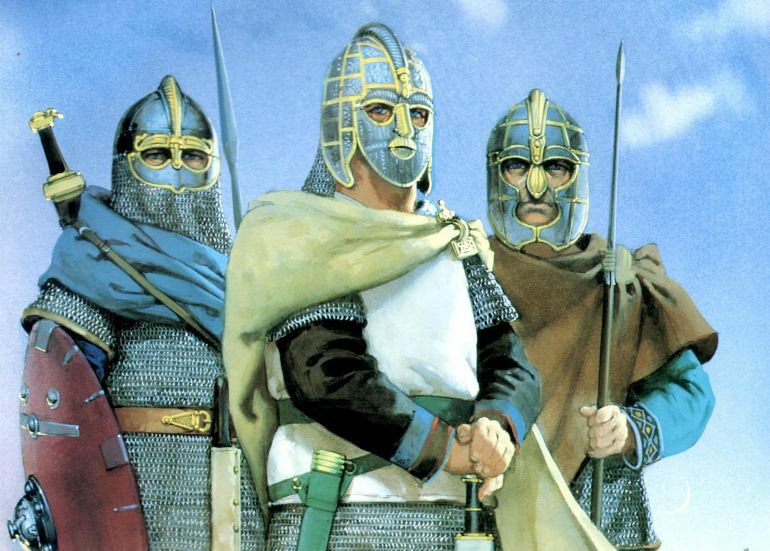 For example, in 1181`AD England, a freedman with a property valued at a substantial £16 (with inflation adjusted, this figure comes to £166,000 or $240,000), was expected to have a full knight’s equipment, including helmet, mail-shirt, lance and shield. Such monetary values were also complemented by advancements in technologies that enabled knights and well-armored soldiers to have some degree of mobility combined with safety. To that end, contrary to popular notions, plate armor usually tended to less cumbersome than their mail counterparts, since the distribution of weight in the former was far more streamlined. Interestingly, as jousting became more renowned as a dedicated spectator event, specific armors were designed for such activities. One particular example from early 13th century aptly showcases the extent of modifications being integrated on the medieval knight armor system. – including the incorporation of larger pauldrons reinforced by extended gardbrace, and the massive ‘frog-mouthed’ helmet with a singular eye-slit. 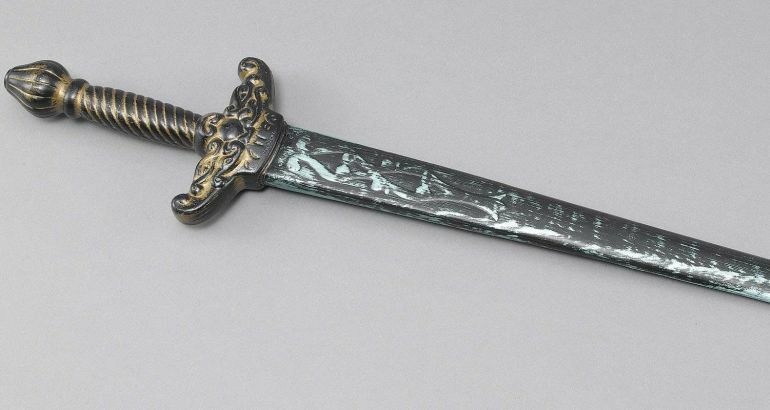 Interestingly, the very shape of the sword carried forth a symbolic scope – as must have been identified by the church. That is because it resembled the cruciform with the crossguard cutting a right angle across the grip which extends into the blade (much like Kylo Ren’s lightsaber). Such an imagery must have played its psychological role in bolstering many a spiritual medieval knight. The image of a medieval knight is incomplete without his horse. But unlike the Mongol warrior who was intrinsically attached to his horse/horses, the horse of the medieval knight was bred for specific purposes. Simply put, the warhorse was used specially for battlefield scenarios, whereas other varieties were used for transport (like rouceys and hackneys) and even recreational activities like hunting (like coursers). Furthermore, there were also prized horses that were only flaunted during parades and tournaments – mostly by the richer knights and the noble lords. To that end, the actual warhorse of the medieval times, also known as the destrier, stood at a height of 5 ft to 5 ft 4 inches (15 to 16 hands), and was mostly an uncastrated adult male (stallion). And beyond just its height credentials, the defined musculature of the chosen horse conformed to its broad chest and short-back, thus combining the advantages of both speed and strength while also upholding crucial stamina needed in actual charges and counter charges. Much has been said about the scope of chivalry when it came to the medieval knight. But in truth, the conceptual elements of chivalry were muddled, while the ‘guidelines’ of chivalry were only codified in 14th century. Simply put, the very ambit of chivalry was loosely defined, and that ‘generic’ system pertained to what was perceived as proper knightly conduct. Many elements of this extensive code of conduct were formulated by the political elite (sometimes involving clergy) and then vowed upon by the knight at his ‘dubbing’ ceremony. In that regard, the basis of chivalry was mainly focused on three factors when it came to actual combat scenarios. Unsurprisingly, the first factor related to the martial prowess and courageous nature of the medieval knight. To that end, it was expected that the knight should be the first to engage the enemy, while also demonstrating his individual ‘heroic’ feats on the battlefield (a propensity that sometimes led to tactical disasters, like in the Battle of Agincourt). The second factor hinted at a fair fight with equal representation of arms and even attacks of opportunity on both sides. The third broad factor (and probably the most important one for political ties) related to loyalty among the knights for their lord. On the other hand, the lord was also expected to be ‘dutiful’ towards his well-armed retainers, by showering them with gifts and sumptuous revenue portions. 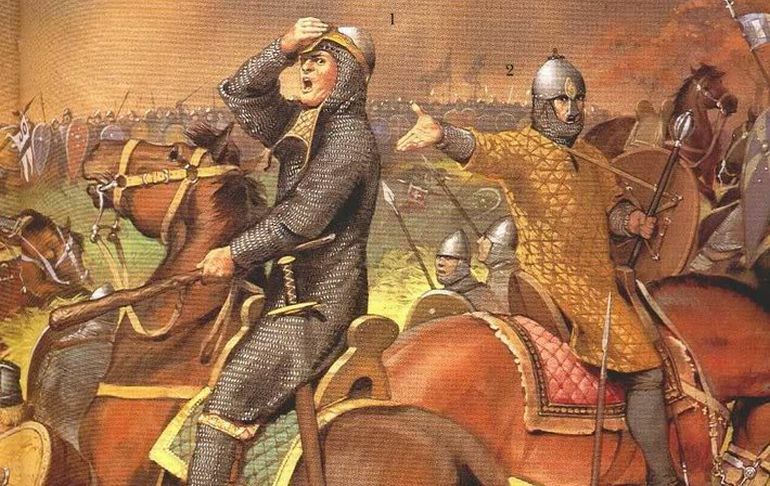 One interesting episode from history, better known as the ‘The Blind Charge at the Battle of Crecy‘, aptly demonstrated such bonds of loyalty. John of Bohemia, in spite of going blind, joined the French king Philip VI, after being called upon to join at the Battle of Crecy. This incident relates to how blind John tethered his horse with a group of other Bohemian knights. This ‘blind yet bound’ body of armored horsemen decided to boisterously charge into the English ranks, but to no avail. While some records talk about John wildly swinging his sword around the Prince of Wales, the blind king must have ultimately met a gruesome death – as was evidenced from the examination of his battered body. According to later assessments, the King of Bohemia suffered a stab injury to his eye socket (with the pointed weapon being pushed right into his skull) and a stab injury to his chest (that probably penetrated his vital organs). His right hand was also found to be cut off, presumably to steal his precious rings and other kingly items. 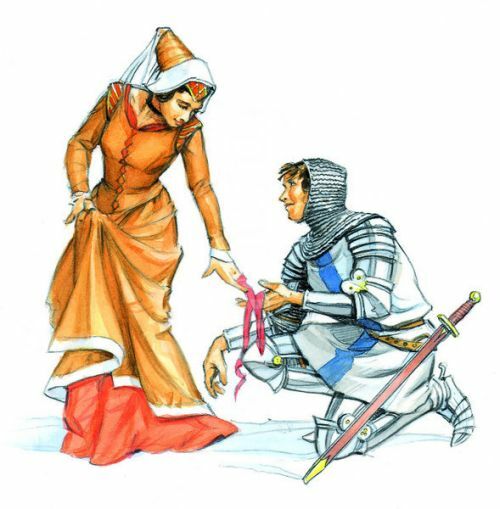 Other chivalrous traditions went beyond battlefield scopes to include social customs, like never giving evil counsel to a lady and treating her with respect. But the etching of the codes of conduct necessarily didn’t mean that every medieval knight followed them to stringent levels. In many cases, it was found that knights largely instigated plundering and looting after battles, for practical (and profitable) reasons rather than willfully going against chivalry codes of conduct. Furthermore, the church also played an important role in ‘modifying’ many chivalry codes that obviously suited its purposes, like upholding of ‘Christian values and duties’ that would have inspired many knights to participate in crusades. Book References: Knight the Warrior and World of Chivalry (By Robert Jones) / Meyrick’s Medieval Knights and Armour (By Samuel Rush Meyrick) / English Medieval Knight 1300-1400 (By Christopher Gravett).